7.2 Identify all extraneous loads to the injured tissue. 7.3 How to Monitor Load? The goal of any rehabilitation is to restore function to the greatest degree in the shortest time, helping people return to their function with minimal risk of re-injury. While absolute rest and offloading may relieve symptoms, they are associated with negative potentials such as decreased tissue tolerance and increased tissue vulnerability in the future. Understanding how tissues respond to physical stress and mechanical loading is helpful in achieving a balance between stabilising an injured tissue and avoiding detraining. According to Mueller and Maluf, biological tissues adapt to changes in the levels of applied stress. Maintaining tissue tolerance is essential to prevent atrophy, whereas overloading results in hypertrophy. Excessively high levels of stress lead to tissue injury and potential permanent damage. The magnitude, time, and direction of stress application determine the overall level of exposure to physical stress. Injury may occur due to a high-magnitude stress applied for a brief period, a low-magnitude stress applied for a long duration, and/or a moderate-magnitude stress applied to the tissue many times. Refers to the conversion of mechanical loads on the cellular level resulting in structural changes. Increased bone thickness and width in response to mechanical loading is the classical example of this hypothesis. Regardless of the type of loading, torsional, compressive or tensile, the mechanical stimulus triggers a release of various chemicals which in turn result in building up layers of tissue and improves load tolerance. Physiologically stressing the tissue, below the level of injury, with sufficient time for adaptation causes cellular response that strengthen the tissue and improves its tolerance. Maintaining mobility while stabilising an injured tissue is required in successful rehabilitation. The key here is to avoid rigidity. Muscular rigidity refers to Co-contraction, occurring in response to pain and/or kinesiophobia. Appropriate level of co-contraction allows mobility to occur once stress is minimised. Pain has a massive influence on our movement patterns. As a pain avoidance strategy, a person with injured ankle may acquire an antalgic gait. 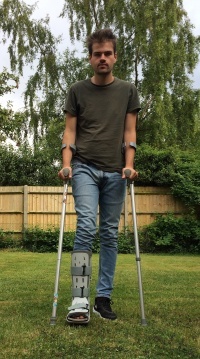 Walking with slight planter flexion and short strides may later develop to a compensatory foot pronation, knee valgus and hip adduction moment, thus affecting tissue loading patterns. Another example is seen when a person develops a co-contraction of Erector Spinae muscle due to flexion-related LBP. This rigidity results in excessive hip movement to compensate for the loss of lumbar flexion. Additionally, the excessive lumbar extension may cause increased load on facet joint and posterior disc elements. The fear of movement could possibly develop to catastrophising and complicate the conditions. Therefore, we need to consider the central elements of pain by implementing desensitization in the rehabilitation program. Acquisition/Cognitive stage: deconstructing the function onto simple movements with repetitions. Retention/Associative stage: recalling and delivering the task after a period of not practicing the task. Transfer/ Autonomous stage: the ability to carry out a task without paying attention to tactics. Ideally, we want to deliver our patients to this stage where they can perform a similar, but different task than originally learned in the acquisition stage. Instructing patients depends on the stage of learning. In the first stage, clause skill is used to eliminate all external influences and drives the focus internally (Intrinsic focused cues) by asking patient to reflect on the purpose and the mechanism of a simple movement e.g. single leg squat. Repetitions in this stage aids cognition and acquisition. In Retention and Transfer stages, training should be external or goal focused. For example, asking patient to move towards a certain target, or doing a task while keeping trunk ahead of knees. The ultimate aim of motor skill learning is to transfer the skill to performance in sport or activities of daily living. The patient needs to move from closed skill tasks (same movement tasks in stable predictable environments) to open skill where tasks/movements are unplanned. Feedback can be either intrinsic or extrinsic. Intrinsic feedback - seen as the knowledge of performance but in can be limiting to learning when in extreme. Extrinsic (augmented) feedback can be from visual demonstrations, using a mirror, verbal instructions or guidance through touching. Timing feedback is also another important element. The rehabilitation then should develop complexity to mimic the reality of patient's occupation or functional aspirations. Random Skill training can be acquired in this stage, by training patient to deliver function on various surfaces, with different external loads and to react to external stimuli. Selecting meaningful exercises that relate to patient's function to improve proprioception. Exercises should also fit patient's physical outcomes when planning a rehabilitation program. Adaptive and progressively challenging exercises allow tissue stress to occur in accordance with the above mentioned principles. For task learning to be carried out successfully, it should be built on several pillars: flexibility, stability, work capacity (muscle endurance) and strength. The elements of strength stretch beyond the ability to deliver high force against relatively low repetition to include generating force rapidly (acceleration), force absorption and eccentric force generation. To deliver the appropriate level of loading, we need to form a baseline of the patient's functional capacity. Communication is essential to understand the functional needs and goals of our patients. Then we would perform ''Performance Backwards Thinking'' by having a certain goal in our minds then go back in stages to retrofit that goal with the patient's level of activity. Firstly, find out what the end goal is, meaning what is the functional activity the patient want to return to. Evaluating tissue damage, cardiovascular capacity, strength and stability can help prevent detraining. Also, one of the important factors is to eliminate triggers of tissue damage. This includes sources that may not be usually considered as injuring. For example, an individual with an ankle injury who sleeps with a heavy cover on their feet, pushing it into more plantar flexion, need to adapt by either sleeping with socks or put a lighter cover over their feet. Determine the force-velocity and length-tension relationship for the muscle. For e.g. 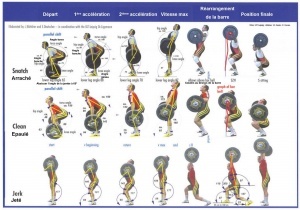 the muscle needs to generate force at different lengths and with different types of contractions. Articular and bone injuries need increased exposure to compressive (axial) loading while keeping the exposure to torsional and shear loads to a minimal. Identify all extraneous loads to the injured tissue. Any negative external or internal forces/factors should be removed. Increased swelling of the training muscles indicates inflammation-overload. Circumferential measures: to be taken after the activity, in the morning and in the evening. Ideally swelling should not increase between days. If it was increased after training it should decrease by the evening, if it is still swollen by the next morning then the training load should be decreased. Stiffness: especially in the morning, is a good mark of inflammation. Link the stiffness to a specific task or movement for e.g. simply ask the patient if they find difficulties doing a simple full squat in the morning. Global loads: technological applications and trackers could be helpful in giving a start point to build up a gradual progressive rehabilitation program without overloading or deloading. It is important that the initial load in a rehabilitation program is not too high as it can lead to injury, but if it is too low it will lead to atrophy. Atrophy occurs within 5-24 days of no activity. Acute:chronic load ratio is the amount of training the patient has completed during the period of rehabilitation compared with the what is needed for a full training session. A ratio of 2.0 means the patient did twice as much, anything more than 1.5 is seen as a spike in training and could be seen as an injury risk. E.g. a patient with a adductor strain would after time off to recover have an increased risk of injury even though the patient might be able to run pain free. When the patient is able to accept load on the affected side under multidirectional loads then progress to load acceptance in bilateral and unilateral landing activities moving towards running. Then progress these activities over barriers and then to different directions. ↑ Mueller MJ, Maluf KS. 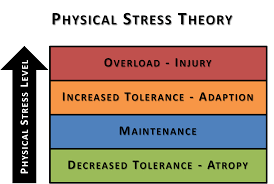 Tissue adaptation to physical stress: a proposed “Physical Stress Theory” to guide physical therapist practice, education, and research. Physical therapy. 2002 Apr 1;82(4):383-403. ↑ Khan KM, Scott A. Mechanotherapy: how physical therapists’ prescription of exercise promotes tissue repair. British journal of sports medicine. 2009 Apr 1;43(4):247-52. ↑ Frost HM. Wolff's Law and bone's structural adaptations to mechanical usage: an overview for clinicians. The Angle Orthodontist. 1994 Jun;64(3):175-88. ↑ 4.00 4.01 4.02 4.03 4.04 4.05 4.06 4.07 4.08 4.09 4.10 Chapter 10. Principles of Exercise Rehabilitation. Physical Examination, in: Petty NJ. Neuromusculoskeletal examination and assessment: a handbook for therapists. Elsevier Health Sciences; 2011 Jan 27. ↑ Gabbett TJ. The training-injury prevention paradox: should athletes be training smarter and harder?. Br J Sports Med. 2016 Jan 12:bjsports-2015.